That bards of old enjoy’d in you! The sound is forced, the notes are few. 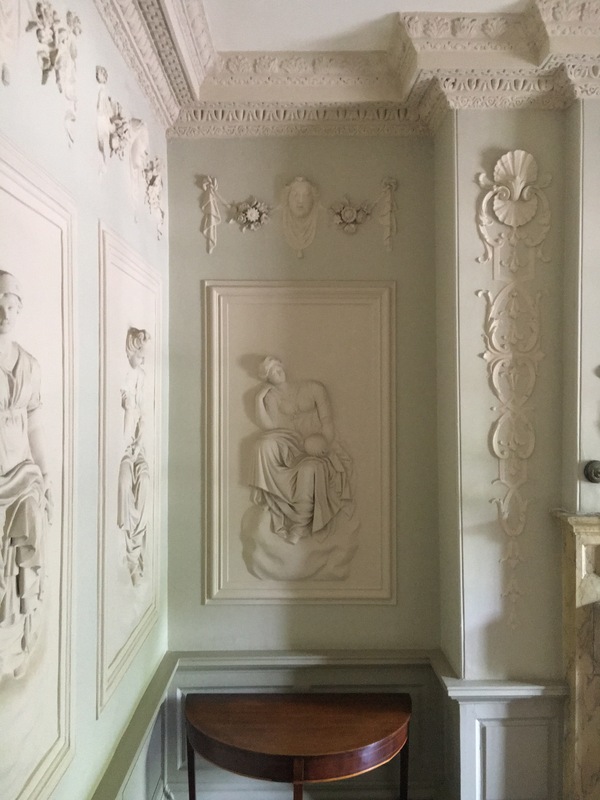 Photographs show the Apollo Room at 85 St Stephen’s Green, Dublin decorated c.1740 by stuccodores Paolo and Filippo Lafranchini. The stuccowork found in Irish houses is rightly renowned for its exceptional combination of vivacity and virtuosity. Yet the attention given to this field of design has focussed primarily on practitioners in the 18th century, with little notice paid to those who came later. It is curious that this should be the case: in the decades between the 1800 Act of Union and the onset of the Great Famine in the mid-1840s several waves of house building occurred across the country, and many of these properties were elaborately decorated. By this date plasterwork was no longer created ‘free-hand’ on site but instead frequently made elsewhere in sections and then installed under supervision. But who were the people who carried out this work? While we often know who was responsible for the architecture, the names of firms and craftsmen who created the interiors seen today seem to be unknown, or at least not to have excited scholarly interest. The three houses featured today demonstrate that more could be done to honour and celebrate these virtuosi who did so much to enhance the properties on which they were employed. Although a much older property existed on this site, Borris House, County Carlow was comprehensively redesigned for the McMorrough Kavanaghs in the second decade of the 19th century by Sir Richard Morrison (see An Arthurian Legend, November 4th 2013). In terms of decoration, the finest room in the building is the one seen first by visitors: the entrance hall. We believe Morrison was responsible for every element of the design here, ceiling plasterwork, scagliola columns, doorcases and chimney piece. Although the room is almost square it appears to be a circular space due to a radiating ceiling and the carefully proportioned screen of paired columns forming a ring around the perimeter wall. On the ceiling eight beams emanate from a central coffered section to meet florid plaster embellishment that includes festoons of fruit, flowers and leaves resting on masked heads, sheaves of wheat and the crescent moon, and a sequence of immense eagles, their heads thrusting into space beyond outstretched wings. The capitals on top of the columns display equal creativity, as they do not correspond to any of the classical orders but are of Morrison’s own design, incorporating a band of lion heads. The skill involved in carrying out this programme of work is outstanding – but who did Morrison employ to transform his ideas on paper into a three-dimensional reality? Emo Court, County Laois has been discussed here on a couple of recent occasions (see Seen in the Round, February 1st last and Of Changes in Taste, March 14th last). Designed in the 1790s by James Gandon, the house’s interiors were only gradually completed over the next seventy years. One of the first spaces to be completed was the dining room, decorated in the early 1830s under the supervision of London architect Lewis Vulliamy. It is likely that Gandon would have proposed a spare, neo-classical scheme here but Vulliamy came up with something altogether more sumptuous, especially on the ceiling which has been divided into a series of sections centred on a rectangle containing a highly elaborate rose (looking more like a chrysanthemum) from which a chandelier would have been suspended. On either side thick bands running the length of the ceiling are filled with ribboned hexagons from which overflow vine leaves and bunches of grapes: this same motif is used again on the perimeter of the ceiling. Meanwhile a pair of demi-lunes immediately above and below the chandelier rose contain an eagle standing on a rippling band of ribbon, its wings stretching beyond crown of oakleaves encircling the bird. Closer again to the edge bare-breasted maidens are flanked by spirals of foliageputti stand on either side of ornamental urns and pairs of doves flutter within floral coronets. Extravagantly absurd and yet executed with such assurance and aplomb somehow the whole scheme comes together. Who deserves the credit for this feat? Ballyfin, County Laois (see The Fair Place, July 21st 2014) has been superlatively restored in recent years and now functions as an hotel that sets a standard for all others in this country and beyond. Ballyfin was designed for the Coote family in the early 1820s by Sir Richard Morrison, on this occasion partnered by his son William Vitruvius. The entire house is an exercise in opulent splendour of the kind John Nash was then creating for George IV at Buckingham Palace. Nowhere is this more manifest than the saloon which at either end has screens of green scagliola columns beneath rich Corinthian capitals. These lead the eye up to the coved ceiling over which once more ornament has been incited to run riot. Here panels contain figures of bare-breasted maidens surrounded by scrolled foliage so similar to those found on the dining room ceiling at Emo Court that both must have been executed by the same craftsmen. Likewise in the corners of the saloon ceiling in Ballyfin are pairs of putti, in this instance jointly supporting a lyre. The bordered runs of vine leaves and grapes seen at Emo are here replaced by long garlands of flowers but the spirit and style are consistent between the two houses. The most striking difference can be found on the Ballyfin’s ceiling entablature where snarling lions (or perhaps leopards) face each other separated by a crowned mask. It’s both deft and daft, and above all thrilling to realise craftsmanship of this calibre was available to patrons in 19th century Ireland. Time surely to celebrate the persons responsible, and to ensure their names and contribution to our heritage no longer remain unknown.